We had a gentleman named Matthew Vest come to the GVis lab the other day to show off his do-it-yourself creation. He was looking for information on whether he might be able to showcase it at the upcoming Coast Day 2011 event that happens each year on the second Sunday of October here at the Hugh R Sharp campus in Lewes. Matthew has done something that most of us dream about doing, something many of us say we’re going to do, and that same something that most of us never get off our duffs and actually do. 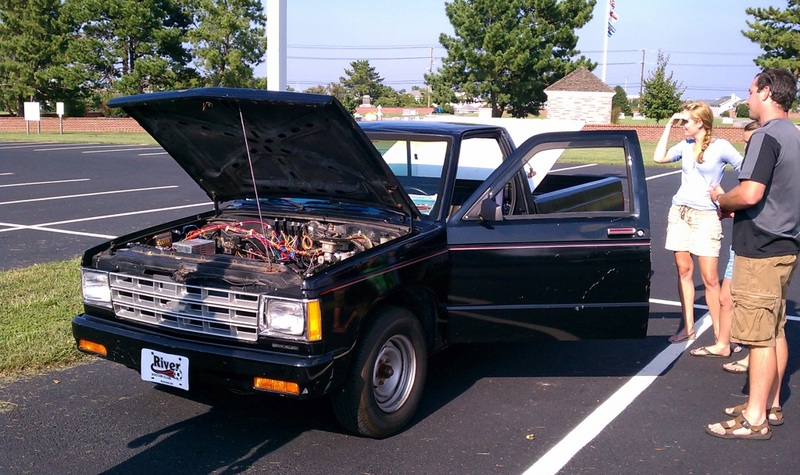 He has taken a 1985 Chevy S-10 truck, removed the gasoline engine and tank, and replaced them with an electric drive motor (from a fork lift he says) and a bed full of 6 volt lead acid batteries (aka ‘golf cart batteries’ – 24 in total). The conversion took him about 2 years to complete and cost approximately $10,000 dollars but now he is the proud owner (and creator) of an all-electric vehicle that will to approximately 40-60 miles on a charge. Matthew went out of his way to select “Deka” batteries to power his creation, which he says are 100% recyclable. Each of the 24 batteries weighs in at 60 lbs, for a total battery weight of about 1450lbs. These batteries are wired in series to generate the 144 volts DC that power the Warp-9 electric motor that replaces the gas engine. 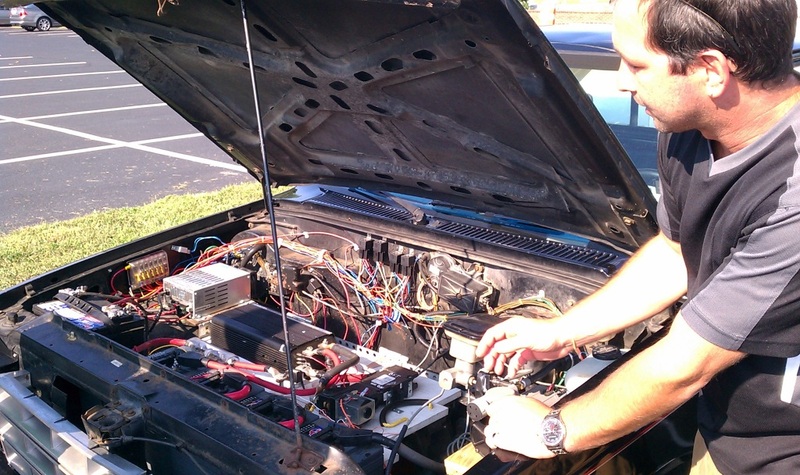 There is one 12 volt battery which is used to power the stock lights, wipers and horn. A Curtis 1231c controller is like the brains of the truck, controlling the power flow. A Zivan ‘smart charger’, which runs on standard 110v, sits behind the driver seat. When fully discharged, the batteries take about 10-12 hours to recharge. The only sound that the truck makes when it is running is the sound of the add-on vacuum pump that is also under the hood. It creates the vacuum that assists with the stock braking system of the truck. Matthew is hoping to touch base with some of the researchers at UD that are involved in the V2G or “Vehicle To Grid” project so that he can assess whether his S10 can also be integrated with the power grid. For more information on V2G and GIEV’s (Grid Integrated Electric Vehicles) you can read more on the Q&A section on the V2G site. 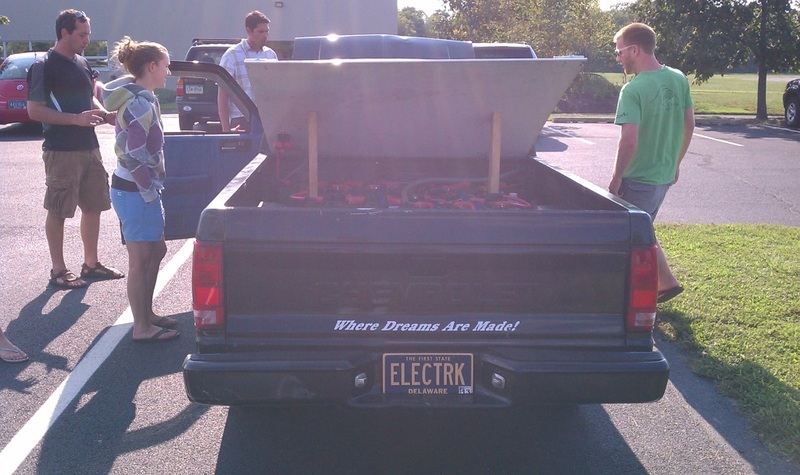 We asked Matt how he got started with the project and he said it just took some research online, a couple of “how to retrofit your gas vehicle into an electric vehicle” books, and some very helpful people on a few of the EV forums. We salute Matt for what turned out to be an excellent EV refit and for his consideration of the environment when he selected the batteries and materials for his electric vehicle project. Well done! Where Have All The Research Vessels Gone?